Teddy Bear clothes wholesale clothing for all types of plush stuffed animals and teddy bears. Outfits and Costumes for BUILD A BEAR® and OUR stuffable plush animals. Plush animal clothing at discount prices. This size range will fit 14"-16" plush stuffed animals and teddy bears. 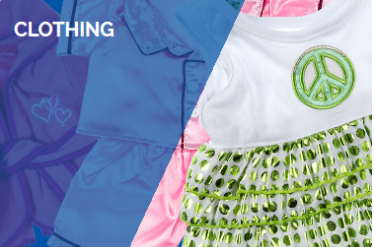 We offer complete outfits, Costumes, Boy clothes, Dresses, Holiday attire, Career and more! Select from a variety of styles for all types of plush animals and teddy bears. Please see our individual categories in the above site menu or at the end of the page for our complete line teddy bear t-shirts, teddy bear pajamas and stuffed animal clothing separates. Bear Clothing for stuffable plush, Build a bear, and 14" -16" stuffed animals. This category features clothing for our 15" Unstuffed animals and will generally fit animals and teddy bears in the 14"-16" size range. ** A Dolly's World and the products we carry are NOT affiliated, manufactured or associated with Build A Bear Workshops®. 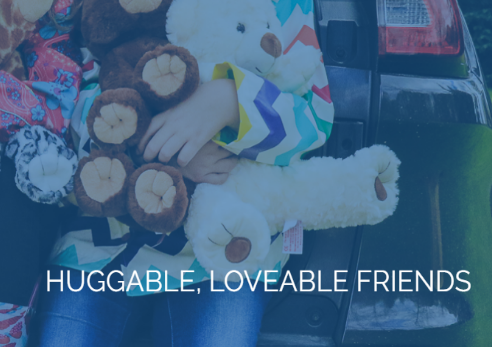 Clothes for stuffed animals, BUILD A BEAR ®, Cabbage patch kids, and stuffed animals. Ivory Ballerina outfit for teddy bears and stuffed animals. Clothing for 14"-16" bears, plush animals and Build a Bear. Clothes for bears and 14"-16" plush stuffed animals. For Teddy bears, and 14"-16" stuffed plush animals. Butterfly Fairy Dress with Wings. Ladybug Costume for stuffed animals, Teddy bears and dolls. Clothing for 14"-16" teddy bears, stuffable plush animals and dolls. Butterfly Polka Dot outfit includes Top, Skirt and Wings. 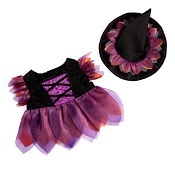 Fairy outfit for Dolls, Bears, and plush. Clothing for 14" -16" stuffed animals and teddy bears . Clothing set for BUILD A BEAR® and 14"-16" plush animals. Clothingfor 14"-16" stuffed bears, BUILD A BEAR ®, and our stuffable plush animals. NEW Love outfit for Teddy bears and 14"-16" plush Animals. NEW Pink jogger bear outfit. Clothing for BUILD A BEAR® and 14"-16" plush animals. Clothes for BUILD A BEAR®, Stuffable plush and 14"-16" stuffed animals. Yellow Butterfly outfit for teddy bears. Clothing for 14"-16" stuffed plush animals . Fits 14"-16" Plush animals and Teddy Bears. Summery Peace Outfit for our 15" Plush stuffable animals. Clothing for 14"-16" teddy bears and stuffed animals. NEW Beach outfit for bears and stuffed animals. Clothing for teddy bears, BUILD A BEAR® and 14"-16" plush stuffed animals. Groovy Peace outfit for teddy bears and stuffed animals. This outfit fits 14"-16" stuffable plush stuffed animals and bears. Red Sparkle Dress and Hat. Green Velvet dress with red fur trimmed coat. Clothing for BUILD A BEAR® , stuffed bears and animals. Will fit vintage Cabbage patch dolls. NEW Gingerbread outfit includes Shirt, Skirt and ear bow. Clothing for BUILD A BEAR ® animals, stuffed animals, teddy bears and dolls. Clothing for stuffable animals, teddy bears, plush and dolls. Clothing for 14"-16 stuffable plush teddy bears, Stuffed animals and BUILD A BEAR. Green Hooded Cape and Dress. This outfit will fit a variety of Teddy bears and stuffed animals 14"-16". 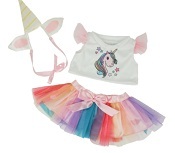 Darling outfit for 14"-16" stuffable bears and stuffed animals. Clothing for teddy bears, stuffable animals, build a bear and dolls. PINK Parka outfit for 14-16" stuffable animals. 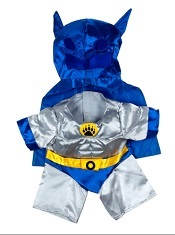 Blue Parka outfit for 14"-16" stuffable animals and bears. Clothing for teddy bears, build a bear, stuffed animals and dolls. Nurse outfit for stuffed bears and animals. Will fit a variety of 14"-16" stuffable plush. Clothes for 14"-16" stuffed animals, Build a Bear and our stuffable plush. Teddy Bear Tuxedo stuffed animal clothing. Fits a variety of 14"-16" stuffable plush animals and bears. 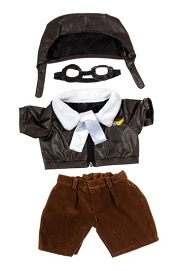 3 piece cowgirl outfit for plush bears and animals. Dino outfit for Teddy bears and plush. Clothing for bears and plush animals. Clothing to fit a variety of 14"-16" Teddy bears and plush animals. SPider Bear outfit, costume or pajama's. 4 piece Special Forces outfit. Clothing for a variety of 14"-16" our stuffable plush, teddy bears and stuffed animals. 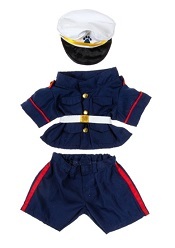 NEW Marine Outfit for teddy bears. Clothing for 14"-16" stuffed animals. 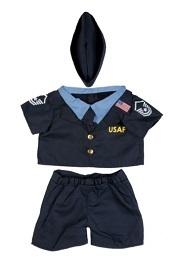 NEW Air Force Outfit for teddy bears. Clothing for bears and 14"-16" stuffed animals. Clothing for BUILD A BEAR ® and 14"-16" animals. Clothing for 14"-16" plush animals and stuffed bears. Clothing for 14"-16" bears and stuffed animals. Clothes for Build a Bear, stuffable animals and plush. Karate outfit for Bears and Stuffed animals . Clothes for bears, Build a Bear and stuffable animals. Clothes for Build a Bear, stuffable animals and stuffed plush. Clothing for 14"-16" stuffable plush, teddy bears and stuffed animals. Clothes for 14"-16" stuffable plush and stuffed animals.